Toast the almonds for 10 minutes in the oven. Let it cool. Mix flour, sugar, baking powder, almonds and cinnamon in a large bowl. Whisk eggs,coffee and vanilla essence until mixed well. Add to flour mixture and stir. Use your hands to bring the dough together. At first it might seem too dry, but the dough will come together and will be sticky. Rub little flour on hand and divide the dough into two. Shape into logs and place on a parchment lined baking tray. Flatten them with height no more than 3/4 inch. Bake for 25-30 mins until the tops are firm and edges start to brown. Take out of oven and cool on a wire rack for 15 mins. Transfer to a cutting board and using a very sharp knife or a bread knife cut ½ “or ¾” thick slices. You can cut straight or diagonal. Place the slices back on the baking tray and bake for 15 mins. (Either make them stand or place on one side and turn to other side after 10 mins). Turn the oven off and let the biscotti stay in the warm oven for additional half hour. Serve as is or with tea/coffee. 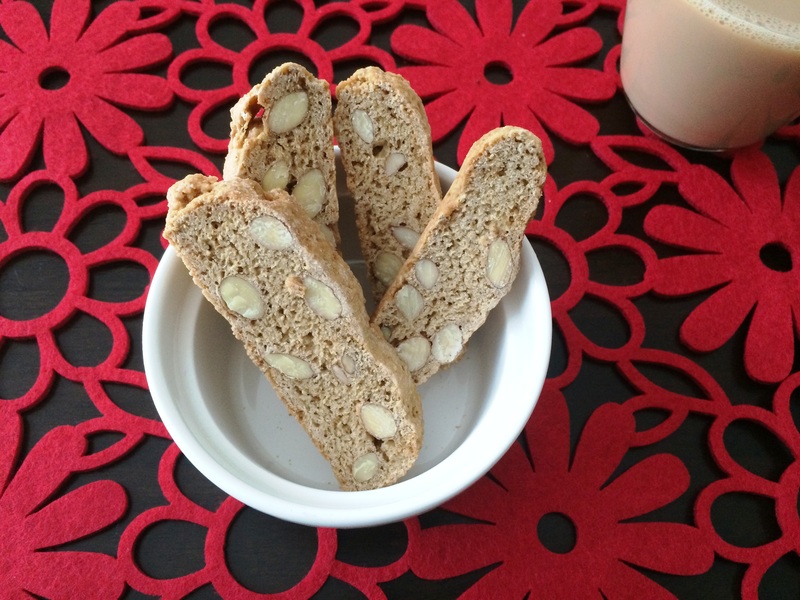 This entry was posted in Cookies/Biscotti/Bars and tagged almond biscotti, biscotti, cofee biscotti, italian biscotti, no butter biscotti, no oil biscotti by PriyaBaby. Bookmark the permalink.